JNN 22 Nov 2014 PRAMBANAN: An eclectic mix of women from around the world will compete in the finale of a pageant exclusively for Muslims in Indonesia Friday, seen as a riposte to Western beauty contests. The women, who include a doctor and a computer scientist, are set to parade in glittering dresses against the backdrop of world-renowned ancient temples for the contest in the world’s most populous Muslim-majority country. However the 18 finalists are required to wear the Muslim headscarf and will be judged not only on their appearance, but also on how well they recite verses from the (holy) Quran and their views on Islam in the modern world. “We want to see that they understand everything about the Islamic way of life — from what they eat, what they wear, how they live their lives,” said Jameyah Sheriff, one of the organisers. 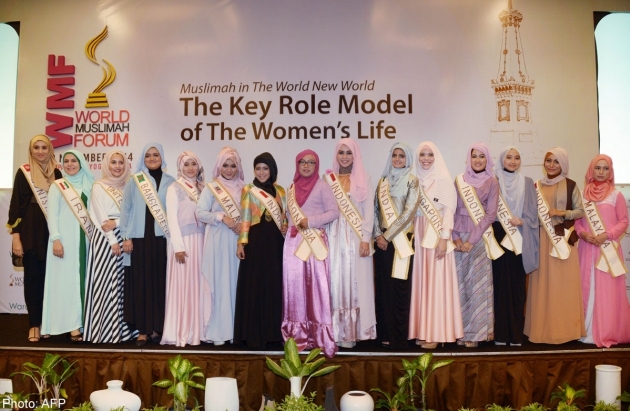 The World Muslimah Award first drew global attention in 2013 when organisers presented it as a peaceful protest to Miss World, which was taking place around the same time on the resort island of Bali. While it remains popular in some countries, British-run Miss World has faced frequent accusations that it is degrading to women, and a round in which contestants pose in bikinis has been a lightning rod for criticism. In an effort to appease hardliners, Miss World organisers axed the bikini round for the Bali edition, but the event still sparked demonstrations from Islamic radicals who dubbed it a “whore contest”. British contestant Dina Torkia said she hoped this year’s World Muslimah Award would not only provide a contrast to Western beauty pageants, but would also dispel prejudices against Islam. “I think the most important thing is to show that we are really normal girls, we are not married to terrorists. This scarf on my head isn’t scary,” she told AFP. However the 2014 pageant has faced challenges, with seven finalists dropping out and others struggling with Indonesia’s complex bureaucracy to obtain visas. Most who pulled out did so because their families did not want them to travel alone, Sheriff said. The Indian contestant missed her initial flight as she was being questioned by officials who were suspicious of a woman travelling alone and wearing a headscarf, although she managed to get on a plane later. Others have gone to great lengths to take part in the fourth edition of the event, with Masturah Binte Jamil quitting her teaching job in Singapore after her employer would not give her time off to participate. Organisers hope to present positive role models for Islamic women around the world and the contestants, who are aged between 18 and 27, include a computer scientist from Tunisia and a newly qualified doctor from Bangladesh. But not everyone was enjoying the final rounds, with Britain’s Torkia saying her initial optimism had turned into disappointment. “I came into this competition hoping that I would leave with my faith increased, but so far it’s been a lot about promotion and media and looking nice,” she said. Friday’s finale caps a lengthy process, which included an online audition followed by two weeks of events in Indonesia. During their time in Indonesia, contestants have visited orphanages and nursing homes, and had their pictures taken at Borobudur, a famous Buddhist temple close to Yogyakarta, Java’s cultural heart. The finale takes place on a stage against the backdrop of Prambanan, a ninth-century complex of Hindu temples on the island of Java that is a UNESCO World Heritage Site. Hosting the event at a Hindu site was a conscious decision to show that Muslims are accepting of other religions, organisers said. This entry was posted in Asia Pacific and tagged Beauty Peagents, miss world contest, Muslim Miss World Contest, World Muslimah Awards. Bookmark the permalink.